. :: KAMAL BAHAMDAN LIVE INTERVIEW ::. 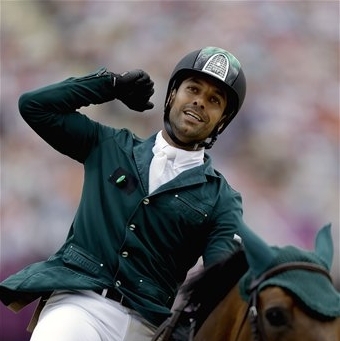 KAMAL BAHAMDAN, ONE OF SAUDI ARABIA'S PROMINENT SHOW JUMPING RIDERS, MADE IT TO LONDON 2012 IN HIS 5TH OLYMPIC DEBUT. Bahamdan and his amazing horse Noblesse De Tess - who has won the hearts of many, achieved a historic win for Saudi Arabia after he and his team members won an Olympic TEAM bronze medal - the first for Arabs in equestrian sport. In the final of the INDIVIDUAL competitions, Bahamdan and Tess jumped 2 captivating clear rounds and only managed to carry 1 time penalty. Both rider and horse were in the clear to win another bronze medal, however came galloping Ireland's Cian O'Conner to also jump 2 clears without any time penalties. Bahamdan and Tess were placed 4th while O'Connor secured the bronze. HORSE TIMES will be conducting a LIVE interview with Bahamdan on Friday August 31 at 4 pm GMT - 8 am PST - 7 pm Riyadh - 6 pm Cairo time. Bahamdan will be reflecting on his team win and more, and will be telling us more about Tess. The interview will be aired LIVE through HORSE TIMES Magazine Google+ page and on the magazines youtube channel feed. We hope you do not miss it but if you do, you can always return to youtube where you can always replay the interview.